Trek uses modular units in its painting and finishing department. 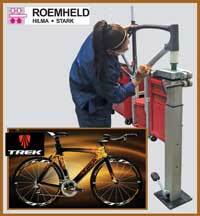 High quality custom painting and graphics are key to the popularity of Trek bicycles, and Carr Lane Roemheld helped the company provide ergonomic workstations for this process. Modular lifting columns are utilized to lift bicycle parts, enabling detailed applications by hand. Carr Lane Roemheld worked on the installation with Project One Paint Manager Craig Haley, who has been employed by Trek for 30+ years. Besides the lifting unit, modular units from Carr Lane Roemheld are available for tilting as well as horizontal and vertical rotating of workpieces, with hydromechanical or electric operation. 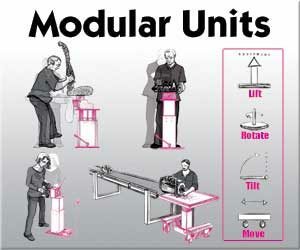 The units can be combined in numerous ways for safe and efficient handling and movement of heavy loads. They can be used for enhanced productivity in conjunction with carts, floor modules, plates, clamps, or height adjustable tables.